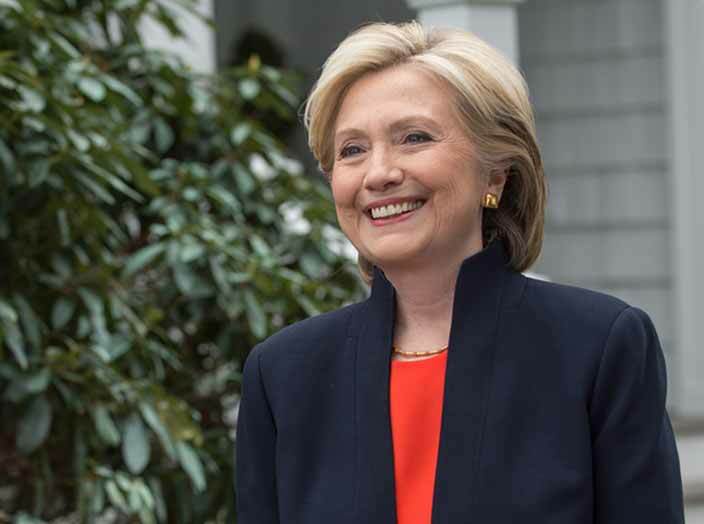 Hillary Clinton as she appears on her campaign website. The main theme in the news involving the Clintons, Hillary and Bill, now is about them getting richer and keeping members of the press at bay. It reminds me of the only time I heard Bill Clinton speak in person, a day I almost got myself arrested. It was in 2008, when Bill was campaigning in Oregon on behalf of his wife’s campaign for the Democratic presidential nomination. The former president drew a big crowd to the Linn County Fair & Expo Center on Saturday that spring. I wasn’t working but went to hear him speak, and I was impressed. He’s a great story teller, and his delivery and mannerisms make listening to him a pleasure, at least for me, regardless of what he actually says. The people in the audience that Saturday seven years ago did not know how lucky they were in that they got to listen for nothing. Elsewhere and since then, it now develops, organizers pay an arm and a leg to hear Bill or Hillary speak. The news stories now say Bill got $500,000 to make one speech in Moscow. About the only good thing about that is that it deprived the Putin gang running that unfortunate country of some of the money they stole. Hillary, meanwhile, has been unwilling to talk to the press about the reports that her and Bill’s foundation raked in hundreds of millions of dollars in foreign contributions while she was secretary of state and in a position to influence government decisions. In a different context, at that campaign event in 2008, the Clinton campaign made sure reporters were kept far away from Bill as he shook hands with a mob of other citizens after his talk, so this thing about avoiding the press is nothing new. I was part of the crowd, but I had made the mistake of briefly standing on a raised camera platform at the back of the hall to chat with colleagues who were working that day. That marked me as a member of the press, and a Clinton campaign official insisted I stay in the back. When I ignored her and kept walking, she called over two Albany cops who for some reason felt they had the authority to stop me. They also had guns and handcuffs, so when they took orders from the young campaign functionary and threatened to arrest me if I took another step, I meekly stood still. Makes me wonder who established the “rules of engagement” for the Albany police. All too often we see those who “serve and protect” be willing to take orders from political hacks. Stupid people bought off on her claims back then. Unbelievably stupid people are supporting her now. Follow the money. Why is it always liberal pieces of work like the Clintons that get such a pass by the major media? “.. get such a pass…” ? You must never read the major media. Does the New York Times count? They have been all over the Clintons since “I didn’t inhale”, Whitewater, Trooper gate, Monica, Impeachment, Health Care, Hillary 2008, Russian “Reset”, Benghazi, E-mail and the most recent Money to Clinton Foundation and on and on and on. It’s false to say the Clintons get a pass by the national media. However, it’s probably true to say that the American public has given them a pass on multiple occasions. It seems the majority of voters agreed with the policies Bill Clinton espoused in his two terms as President. He has even higher polling support these days since he retired. Or maybe it’s a lot more likely that the majority of voters tolerate the Clintons because they strongly don’t agree with what the far-right republicans keep putting up as their platform on what they intend to do. So the answer is to put the King and Queen (Clintons) of CRONY CAPITALISM in place? Such wisdom! This country is doomed if Hillary gets elected POTUS. Neither of the Clintons know what shame is. Thank you for the first hand account of your experience Hasso.